I remember that story well, JM. And what's happening in Standing Rock heartens me considerably. It's good to be reminded that there are still plenty of decent people in the world, capable of necessary humility & atonement, unafraid of actually being emotionally mature & willing to face the shadow of their own privilege -- often a privilege they neither wanted or asked for, either. Hatred & irrationally consuming fear are often powerful in the short run. But in the long run, Auden was right when he said, "We must love one another or die." There is really no other fit way to live. I've never heard that quote before, Tim. It gets right to the heart of life. And, yes, how heartening to see something this beautiful, this powerful, happening. It feels like an energy that could ripple out and shake the world. And thanks for remembering that old Cap story: it was a LONG time ago! Well, since so many politicians are power-mad, Lex wouldn't be that different. And he's a genius—so he'd be able to handle global challenges with intelligence (and some Luthorian cunning). Always great to hear from you, Jeff. Hope all is VERY well with you and yours. I was glad to hear of this as well and I do have that issue of Captain America. It shows that sometimes the best way to win a fight is to not fight at all. An important message in the real world...and in the world of superheroes, where dropping a building on a "bad guy's" head is often the way problems are solved! This is a beautiful and sorely needed moment in the American story. I'll admit I hadn't made the connection to the Cap story, but it's a wonderful allegory or maybe blueprint that's finally been realized in flesh and blood. It does my soul good to meditate on them both. "Beautiful and sorely needed." Perfectly said, David. Thanks. It was an interesting moment, it wasn't precedent setting. Similar things had happened in the past, in fact I bought that comic as a back issue, and when I checked the date, I actually thought that you were referencing a similar event from around then. I think part of teh reason why is because we keep rewriting the history on it and it is never really accurate. Always skewing too far one way or the other. That is neither here nor there though. I will say that Natives are one of the most interesting groups in America. When I say that people think I mean the traditions and history, but I don't. I'm not saying that isn't interesting, it just isn't what I'm talking about. This guy I've known since I was 13 is a member of the Chippewa tripe. He is part Indian and white, and is a self described moderate liberal. These give him an interesting perspective on the whole experience. As such, he will on occasion talk about the goings on of the tribe. The inner workings are really interesting as they apply to modern times. Especially in relation to how people think of the tribes. One thing you should also know is that the Dakotas have probably the worst relations with Natives and Michigan not THE best, but one of the best among the states. One interesting thing is that Indian tribes are usually really, really, socially conservative. One example is that that guy I know, when he was applying to be a member (he is now literally card Carrying Native American)it got held up for months. Usually it is really easy, but a member of the tribal council came out as gay and they had to figure out what to do about it. The reason why that kind of thing is interesting is because usually they have to work with fairly liberal groups to get some things done. There are sometimes negotiations about what is to be done. Another is trouble dealing with other tribes that still have very old but strong wounds. For instance, did you know that Sioux isn't the name of the tribe, its a slur that means "little snake" given to them by another tribe. So when cooperation is needed for larger goals it can all become strained at times. The most interesting thing though, is the religious aspect. Many people have a view of Indian mystics, but in reality most are like Baptists and Catholics. As such, there is sometimes an interesting tightrope walk done as to how to keep the world of religion and tradition both able to stand and coexist. It isn't so much an issue anymore, but it is interesting how they sourced it all out. It is interesting for several reasons not the least of which that it was attempt to keep the culture alive in a world that saw it in a different way. It is in someways the inverse of Judaism, where the tradition is influenced by the religion that is practiced. Its an interesting scene. Just the amount of negotiation over the past 100 years. I think the single most heartbreaking book I've ever read was BURY MY HEART AT WOUNDED KNEE. If you haven't read it, I highly recommend it. What we visited upon Native Americans was a true horror and one we have yet to atone for. What happened at Standing Rock was a small, beautiful first step. It isn't really a first step. As I said, similar actions had occurred. Actually, I think one of my Indian pals (yes I have known two Indians and their families, one since adolescence and one since kindergarten.same tribe actually) told me that the government had made some kind of apologetic act. I definitely remember similar acts happening in the past, so by definition it couldn't have been a FIRST step. There was definitely an act done for the code breakers in WWII, I remember that. Didn't get much press because, you know... a world war. Again, the Indian wars (which didn't end until a year after my grandmother was born, Jerry Siegel was like 4) are really, really complicated. Especially when you get to pre-Civil War America. As a history buff, it can become a headache very fast. That's fascinating, Jack. Thanks for the insight. Just found out yesterday Ben Reilly is back... not sure how that is possible... get to proposal writing. Look, if this lasts past the event someone is going to right a new series starring him. Why not you. You deserve this, you make sense with this. Make it so. Fight your natural hippie instincts and be the first. None of this in jest. I read about this yesterday, as well. I'd write Ben again in a heartbeat, as I think you know. In fact, I said that to Dan Slott last summer when we were at a convention together. That said, a) the decision isn't mine, it's Marvel's and b) from what I read, they've brought him back as The Jackal. So he's a villain now. Still, if Marvel comes calling, I'll be there! ION all honest I'm not entirely sure Ben is back. I mean, I know its hard to believe anyone could just start calling themselves that. Especially since names are non-interchangeable. Still, having been cremated and ashes scattered, and then coming back? Even in the world of comics, that is one hell of a magic trick. Of course, maybe it is explained. I haven't read the comic. Which I'm sure is not a shock. Come on Dematteis, you WROTE the Clone SAga (or part of it) you know how many of those jerks were running around, except you probably don't because who the Hell would keep track. End of the day, I love Ben. I hope he's back. I hope I get new stories about Spider-Kerouac. I hope you write them. But, I have been reading comics long enough to never take such things at face value. And Slott sort of has a history of doing things like this. Of course it isn't Marvel's decision. It's mine... and the rest of the readership. If there is enough support for the book they will do it. Just make sure Marvel's aware your open to the idea. Point is I'm excited about Renew your Vows #2 next week. 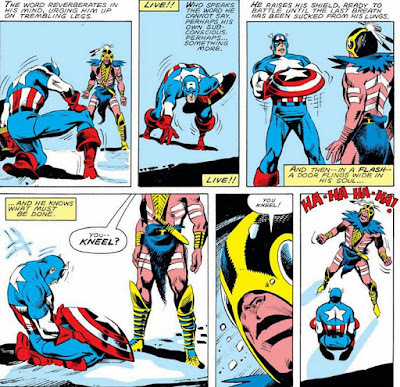 I remember when, after I killed off the Red Skull, Gruenwald (or was it Carlin?) had a scene where Skull was cremated, just to make sure everyone knew he was dead for "real." Guess what? He came back! And, yes, I think lots of us hope he's really back...and that he's really Ben, not a new Spider villain. Fair enough, but Red Skull was brought back with a clone, and if there is one thing Multiplicity taught me its that cloning a clone doesn't work well. Yes, I am claiming that Michael Keaton comedy rules are cannon in the Marvel Universe. They used magic for Kraven, and aunt May was an actor. I still don't know how Harry came back...except that somehow it was Pete's marriage that was doing it. Wait, is he a soulless hellspawn now? Seriously, that is unnerving... and rich for story possibilities. However, the thing that makes me most skeptical is that Marvel these days (and Dan Slott in particular) loves the old bait and switch. Comics absolutely have a lot of ways to resurrect the dead. The also have alternate realities, shape changers, holographic projections, LMDs, and all kinds of stuff. He's such a fantastic character. I really hope he's back and that he's the Ben we know and love. I love Ben. He is a great character, with a lot of potential. However, there are already WAAAAAY too many Spider-people running around t4h Marvel U these days. The brand has become a bit deluded. What's more, if there were a new Lost Years tales, it adds a great tragic nature since we know where the story ends. That fits in perfectly with the character and he previous series. More LOST YEARS sounds great to me. Sign me up! The way I looked at it I think that Ben is A Jackal, not THE Jackal. I would like Ben to return as well, but I don;t see it as being more than a convenient plot device. I am waiting for Marvel to call you as well. Ben is A Jackal? How many are there? I'll be waiting for the phone to ring, but I won't hold my breath! I think there's an upcoming cover that features Peter Parker caught between what appears to be the original Jackal and Ben Reilly. But, you know, Jackals...there could be hundreds of those guys running around! I know of at least one other version that popped up in the DARDEVIL VS. PUNISHER mini-series from a while back. He called himself "The Professor" and stuck a bit closer to the original Clone Saga version in terms of personality, so his conflict with the Punisher was a more fluid continuation of Frank's animosity over having been tricked into working for him. I loved writing the Jackal during the Clone Saga: he was kind of like the Joker, if the joker had been a brilliant geneticist. I like the Joker comparison. That's always the vibe I got from him, but specifically tailored to Peter Parker's strengths and weaknesses. I like the Conway origin sequence where Miles Warren takes on the Jackal persona because he can't accept that he's killed his assistant Anthony Serba. "The Jackal did it." It's a nice contrast to the way Peter took responsibility for his role in Uncle Ben's death. And the Jackal's obsession with cloning plays into Peter's tendency to be his own worst enemy. Had the Clone Saga played out as originally intended, I think the Jackal could have become Peter's arch-enemy. I'm kind of hoping Miles Warren emerges from CLONE CONSPIRACY as something more than Osborn's puppet. I agree that the Jackal had the potential to be THE Spider-Man villain. An eccentric, brilliant, multi-layered lunatic. Doesn't get better than that!